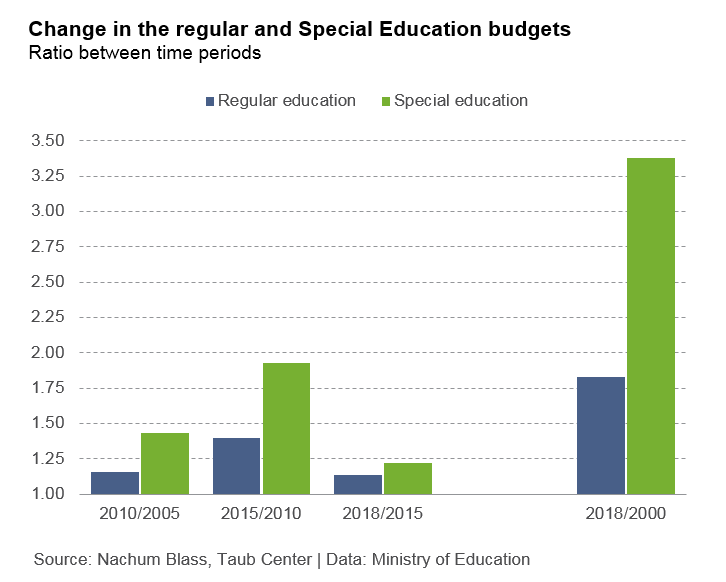 Between 2000 and 2018, the Ministry of Education’s budget for Special Education increased at almost twice the rate of the overall education budget. This extraordinary growth took place during a time in which the overall budget itself witnessed an almost unprecedented 83% growth. The primary reason for the rise in the Special Education budget was the large growth in the number of students requiring Special Education. While the overall number of students in the education system has increased by 33% since 2005, the number of students in Special Education rose by 127%. The growth in the number of Special Education students over the past two decades was particularly rapid among students diagnosed with autism — their number rose from 894 in 2000 to 11,145 in 2018 — and students with serious behavioral disorders — their number rose from 2,347 to 17,483 over the same period. It is important to note that the share of special needs students who are mainstreamed has not changed substantially and remains between 38%-44%. Among those students learning separately, the division between students in schools specifically for students with special needs and those who are in special classes within regular schools has also remained quite stable: about one-half are in special schools and the other half are in separate classes in regular schools. The growth patterns of the Special Education student population, and these students’ placement in various educational frameworks have significant consequences for the Ministry of Education budget. Read the full study on the latest trends in Israel’s education system.